It is no secret that with the dominance of the Asian markets, especially China, many brands have brought out extraordinary limited editions to commemorate special events in this part of the world. The limited editions connected to the Chinese Zodiac signs especially, have become a category all on their own. 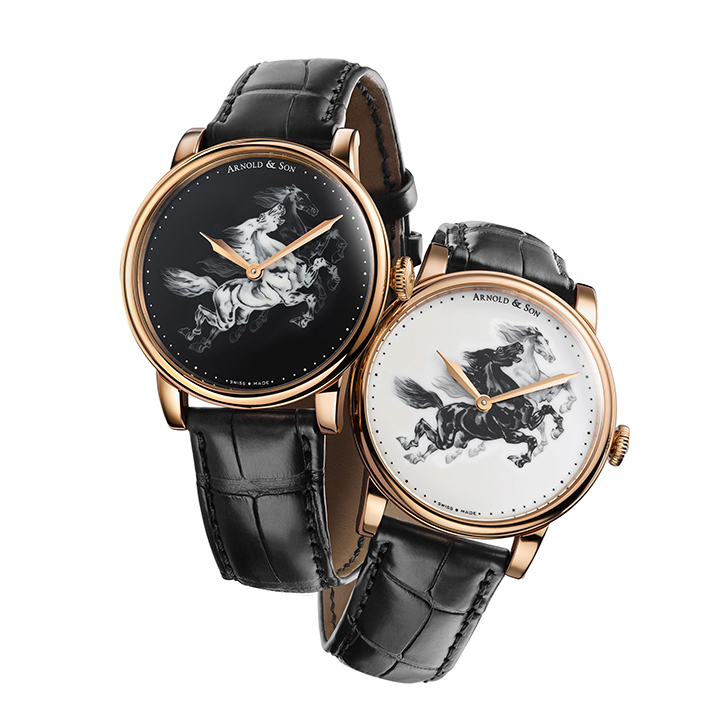 Of course these watches feature the animal connected to the zodiac sign of that particular year, but most brands go a step further and bring these animals to life, with the most extraordinary, and often rare savoir-faire that only the Swiss brands know how. Last week we showed you the amazing Panerai Luminor Sealand dedicated to the year of the horse, but another great example of this category of watches is the new HM Horses set by Arnold & Son. Since on January 31st as we entered the Year of the Horse, this animal gets a prominent place on the dial of the new watch. 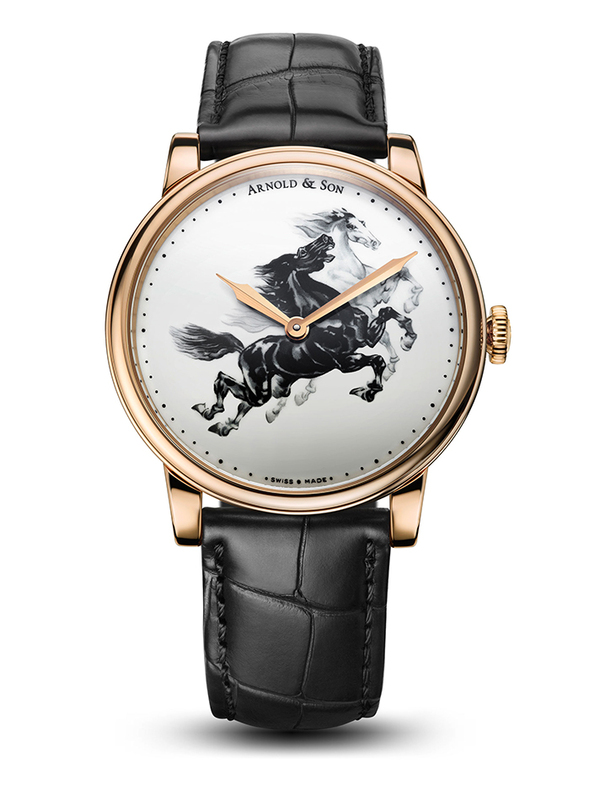 Available with a black and white lacquer dial, they feature a pair of meticulously painted horses. These tiny miniature paintings show with great detail the dynamic grace of these noble animals. This truly gives the dial the depth it needs to really pop out at you. Arnold & Son made a wise choice to keep the rest of the watch as simple as possible; a thin, 18K rose gold case combined with elegant hands that allows you to read the time with ease, yet does not drawn away too much attention. A watch like this needs a mechanical movement. 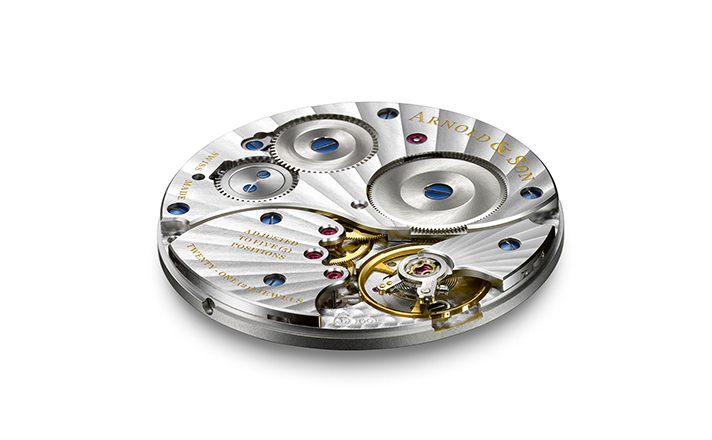 Arnold & Son opted for their A&S1001 caliber. This movement, made in Arnold & Son’s manufacture in La Chaux-de-Fonds, combines old school elegance with modern day performance. Organic shaped bridges feature hand chamfered and “Côtes de Genève rayonnantes” , a Geneva-stripping that radiates from the balance wheel. Although this gives the manual wind movement a very classical look, amplified even more by the blued screws with their beveled and mirror-polished heads, it is a modern day performer. Two mainspring barrels give the watch a 90 hour power reserve, and that is even today, not very common. Unlike dragons and snakes, is the horse an animal that is loved beyond Asia. From the plains of the America’s, to the green meadows of Europe and the deserts of the Middle East and Northern Africa, in most cultures, the horse has played an important role. 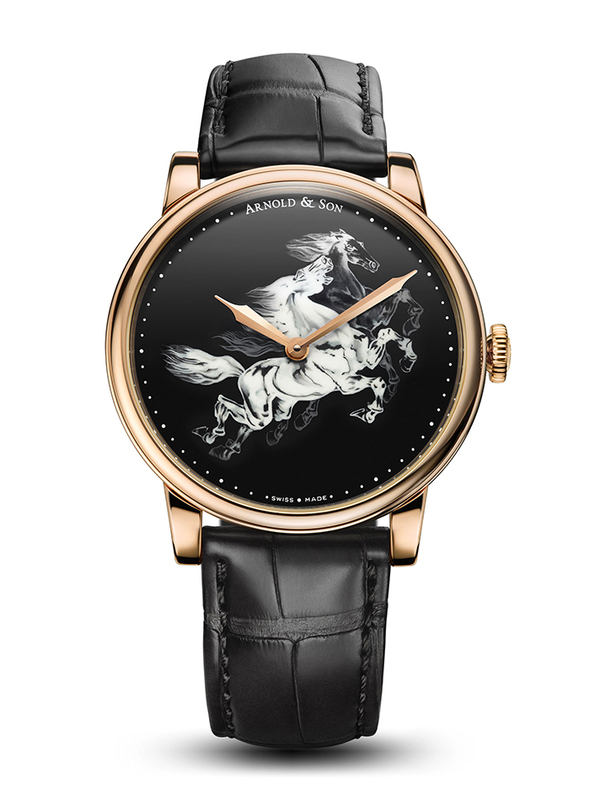 Given the craftsmanship that Arnold & Son has placed into this special edition, the demand for this watch might be a lot higher and less geographically pin-pointed, than the 28 sets of two watches that are available right now. Read Revolution International Digital Editon on iPad, Android or desktop with the Zinio newsstand app.